"I never eat any beef without A5 class！" Have you been ever heard a such creep sentence from your girl friend ? But it's doubtful whether the expensive A5 class beef will taste good or not. A suet tastes nothing, even if it melts in your mouth. The source of taste is Amino acid from a lean meat. "A" of "A5" shows a ratio of fabricated meats, and "5" shows evaluations of "Marbling, Gloss, Firmness, and Color & Quality." If it will lack one of those four, it will be a lower rank "4". So, the rank doesn't show whether it will taste good or not. 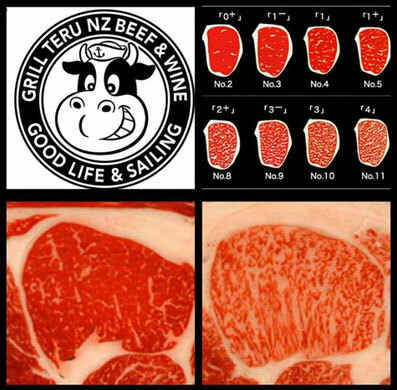 Instead of it, you can use B.M.S (Beef Marbling Standard) for estimating whether a meat's taste will be good or not. 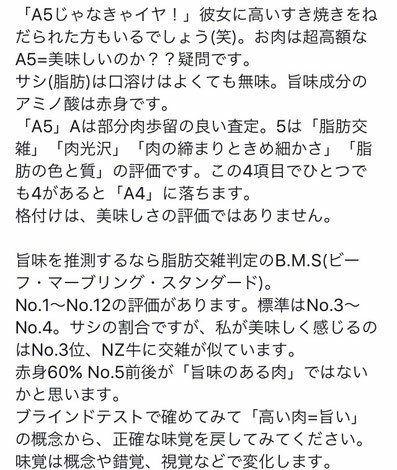 B.M.S has twelve ranks as No.1 to No.12 and standard rank is No.3 or No.4. My feeling that the meat tastes best is in No.3. It looks like about same Marbling as the New Zealand Beef. I think that No.5 as 60% of a lean meat tastes good. I will recommend you to try a blind test and make sure that an expensive meat isn't same as tasting good.It's a way to come your sense of taste back to your instinct. Your sense of taste will change by your imagination, illusion and visuals.